We have come to a day that we have looked forward to for a long time – some of us longer than others. Some who were a part of the original plans can’t be with us today in person, but I know they are here in spirit. 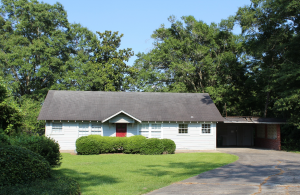 What began as a dream more than twenty years ago became a realizable idea back in 2013 when our Brick House was whisked away by a tornado and the decision was made to put the insurance money into the long-lingering – and somewhat anemic – Building Fund. As time passed and it was becoming more and more evident that the Gray House was in need of a miracle major repair$ and that we needed more education space, we began to look at the dream more seriously. We began looking at our drainage issues… and then we sort of overlaid the dream building atop a topographical survey done by Shows Dearman & Waits… and then we took our dream to the City of Hattiesburg. The trip to City Hall didn’t turn out at all as we had hoped. Setbacks and variances and inconveniently placed sewer lines put the kibosh on the dream. What about putting the dream where the Gray House is, someone asked. Well… why not, we said. And then the fun began in earnest. More people came through our doors than I can count…and I am pretty sure this is out of sequence. Our architectural firm of Landry & Lewis, along with the careful shepherding of Lynn Greer and Jason Landry, gave us a vision of a new dream. Bob Holliman worked up a conceptual e$timate of how much the dream would co$t. We went back to Lynn for a revised, slightly less ambitious dream. Southeastern Contracting was awarded the contract for building the dream, and on July 5, 2016, I sat on 37th Avenue with my iPhone videoing the last hours of the Gray House. And here we are. June 25, 2017. Mike Keith’s Water Flow Productions wrapped the dream in lush landscaping that you’d think has been here for a lot longer than the few months it has. It’s been a long (well, I guess not that long) strange (in a good way) trip. Bishop Seage is blessing our dream and consecrating the work that will be accomplished here in Grace House. If I were to try to thank those who made this dream possible, I know I would leave folks out, so I will simply thank God for this wonderful place we call Ascension and for all those who have supported this dream with their time, their talents, their prayers, and their financial commitment. This is a dream come true.